Spinal cord lipomas are usually associated with spinal dysraphism and is most common in lumbosacral region. Spinal intradural lipoma is a rare condition accounting for less than 1% of spinal cord tumours and is most prevalent in cervicodorsal region. Intramedullary spinal cord lipoma of cervical spine not associated with spinal dysraphism is one of the rarest lesions. They usually present insidiously with slowly progressive myelopathic deficits. We present a case of nondysraphic intramedullary spinal cord lipoma with exophytic component and intracranial extension. A 30 year male patient presented with wasting of muscles of left shoulder and left forearm with resultant weakness for last two months and myelopathic signs. 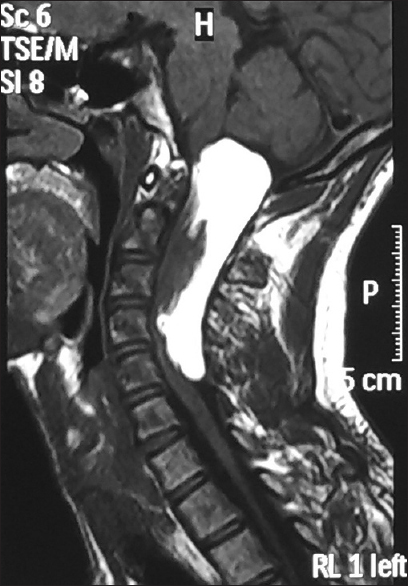 Magnetic resonance imaging revealed a T1 hyperintense , T2 hypointense lesion on the dorsal aspect of cervical spinal cord with intracranial extension and exophytic component. There was no contrast enhancement, fat suppression image indicated a lipoma. The patient underwent cervical laminectomy with foramen magnum decompression with subtotal resection of intramedullary lipoma. Histopathology examination confirmed the diagnosis of lipoma. Subtotal resection of intramedullary lipoma is a reasonable and acceptable surgical option considering the benign nature of lesion and high probability of neurological deterioration due to dense adhesion between lipoma and neural tissue. Spinal intradural lipomas are rare lesions constituting <1% of all intramedullary spinal cord tumors. Most of the spinal cord lipoma are associated with spinal dysraphism and are usually located in the lumbosacral region. Intramedullary, lipoma not associated with spinal dysraphism is very rare., Most of them are localized in cervicodorsal region and present in the second and third decade of life. A 30-year-old male patient presented with progressive weakness of shoulder and forearm muscles for 2 months. He also complained of numbness and paraesthesia of both upper limbs. There was evidence of progressive wasting of left shoulder muscles. Physical examination revealed significant wasting of left shoulder, left upper limb monoparesis, grade 3/5; proximal more than distal muscles, signs of cervical myelopathy in the forearm, and hyperreflexia. He did not have any gait disturbance or bowel bladder involvement. Radiological workup revealed a dorsally located hyperintense lesion on T1-weighted image (T1WI) with cord compression [Figure 1]; which was hypointense on T2-weighted image (T2WI) at cervicomedullary junction extending upto C4 spinal segment [Figure 2]. Fat suppression images showed hypointensity [Figure 3]. There was no contrast enhancement [Figure 4]. There was no spinal dyspharism. The patient was taken up for surgery in prone position with electrophysiological monitoring. Suboccipital craniotomy and posterior midline cervical laminectomy of C2–C4 vertebrae was done. A midline durotomy was performed and craniocaudal extent of tumor was delineated and exposed. Tumor was intramedullary in location with prominent exophytic component and was yellowish in colour. Subtotal resection of the lesion was done from dorsal to ventral direction under neurophysiological monitoring. Total excision was not possible due to dense adhesion between the lesion and ventral cord. Postoperatively, patient had some reduction in muscle power; patient showed neurological improvement with physiotherapy. Histopathology confirmed the diagnosis of lipoma. Spinal cord lipoma account for <1% of all spinal cord tumors. Almost always they are located dorsal aspect of cord, subpial in location and hence are considered juxtamedullary. In most of the cases, they are associated with spinal dysraphism. Lipoma consists of mature adipocytes lying in fibrous connective tissue. Striated muscle, neural tissue, epithelial tissue, and other mesenchymal derivatives may also be found in lipoma. The adipocytes do not have any atypical features. Intramedullary lipoma is the most common dysembryogenic lesions, accounting for 1% of all intramedullary tumor that has an embryological basis., It is contentious whether the lipomas are true neoplasm or hamartoma. Lipomas associated with spinal dyspharism are considered hamartomaous whereas nondysraphic lipomas are thought to be a true neoplasm. Etiology of lipoma is not well established yet. Several hypotheses has been propounded to explain the intramedullary location of fatty tissue. The “developmental error hypothesis” postulates that mesenchymal cells, precursor to adipocytes become misplaced during neural tube development and migrate into the developing neural tube before closure, and develop into a lipoma later. This explains dorsal location of the lipoma. Growth of lipoma diplaces the dorsal roots more laterally. “Metaplasia theory” holds the metaplasia of connective tissue as the cause of formation of lipoma. The presence of peripheral nerves, dermoid cyst, skeletal muscle, and lymphoid tissue in intramedullary lipomas have been explained by hamartomatous theory., Another hypothesis proposes that adipocytes arise from the cells giving rise to spinal cells. In normal conditions, mesenchymal cells form spinal vessels but are capable of differentiating into adipocytes unless inhibited by neural crest cells. If neural crest cells are defective, the inhibition fails, and mesenchymal cells form adipocytes. Magnetic resonance imaging (MRI) remains the most sensitive modality for the tumor. Fat is hyperintense on T1WI, hypointense on T2WI with no contrast enhancement. Fat suppression sequence identifies lipoma from blood or calcification which remains hyperintense. The other group comprised adults, mostly in their second or third decade of life, who present with slowly progressive neurological deficit which may remain static for long durations. These lesions become symptomatic as enlargement of lesion occurs due to fat deposition in metabolically normal fat cells. In most cases, the clinical course is static. In some cases, they can progress slowly with neurological deterioration. Management of spinal cord lipoma is controversial warranting a tailored approach which may include observation, biopsy, subtotal removal, gross total removal, and spinal cord decompression. Incidental lipoma can be managed by observation for a long period until there is neurological deterioration. For patients presenting with neurological deterioration, spinal cord decompression with subtotal resection may be the best option considering the dangers of neurological deterioration in attempting to remove an adherent tumor and the indolent course of the lesion on the other hand.,, Few cases of excellent result in total or near total removal have been reported. Intraoperative ultrasound is very helpful delineate the extent of lesion as lipoma is anechoic. Lasers are very valuable adjunct in excision of lipoma as the laser vaporize the fatty tissue due to their high water content. Needless to say, intraoperative neurophysiological monitoring improves postoperative outcome. Delayed instability rarely occurs following laminectomy for intramedullary tumor removal in adults. While laminoplasty may be a reasonable option, it is not required in the adult population. Postsurgically, most of the patients have an uneventful course with variable improvement of neurological deficit. Intraspinal lipomas, being congenital lesions not only compress but would actually replace normal tissue during development resulting in less redundancy in the functional pathways. Hence, there is greater chance of permanent injury to the residual neural tissue postoperatively. Therefore, early surgical decompression is recommended before irreversible spinal cord dysfunction sets in, following which, surgical results are suboptimal. Nondysraphic intramedullary lipoma of the spinal cord is one of the rarest lesions of congenital origin. Usually, they have an indolent course and can present in early childhood or early adult life depending on size and rate of growth of lesions. Patients have slowly progressive neurological deficit. MRI is the most sensitive imaging protocol. Due to the benign natural history of lesion, spinal decompression, or subtotal excision of lipoma seems to be the best bet against sudden neurological deterioration. Drapkin AJ. High cervical intradural lipoma. J Neurosurg 1974;41:699-704. 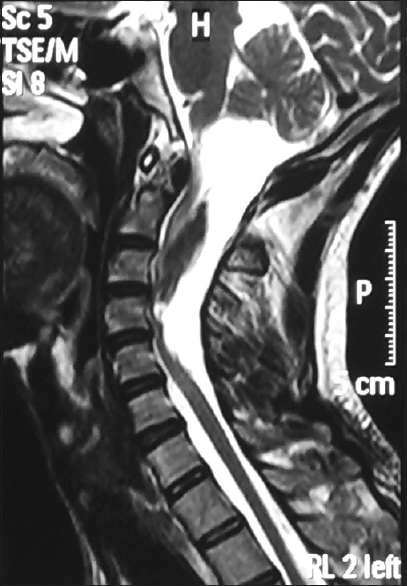 Fujiwara F, Tamaki N, Nagashima T, Nakamura M. Intradural spinal lipomas not associated with spinal dysraphism: A report of four cases. Neurosurgery 1995;37:1212-5. Lee M, Rezai AR, Abbott R, Coelho DH, Epstein FJ. Intramedullary spinal cord lipomas. J Neurosurg 1995;82:394-400. Giuffrè R. Intradural spinal lipomas. Review of the literature (99 cases) and report of an additional case. Acta Neurochir (Wien) 1966;14:69-95. Schwartz TH, McCormick PC. Intramedullary tumours of the spinal cord. In: Batjer HH, Loftus CM, editors. Textbook of Neurological Surgery: Principles and Practice. Vol. 2. Philadelphia: Lippincott Williams and Wilkins; 2003. p. 1864-71. Ahmed O, Zhang S, Thakur JD, Nanda A. Nondysraphic intramedullary cervical cord lipoma with exophytic component: Case report. J Neurol Surg Rep 2015;76:e87-90. Mori K, Kamimura Y, Uchida Y, Kurisaka M, Eguchi S. Large intramedullary lipoma of the cervical cord and posterior fossa. Case report. J Neurosurg 1986;64:974-6. Fleming KL, Davidson L, Gonzalez-Gomez I, McComb JG. 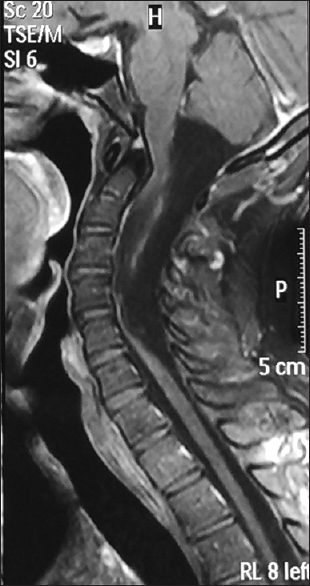 Nondysraphic pediatric intramedullary spinal cord lipomas: Report of 5 cases. J Neurosurg Pediatr 2010;5:172-8. Muraszko K, Youkilis A. Intramedullary spinal tumors of disordered embryogenesis. J Neurooncol 2000;47:271-81. Ammerman BJ, Henry JM, De Girolami U, Earle KM. Intradural lipomas of the spinal cord. A clinicopathological correlation. J Neurosurg 1976;44:331-6. Timmer FA, van Rooij WJ, Beute GN, Teepen JL. Intramedullary lipoma. Neuroradiology 1996;38:159-60. Catala M. Embryogenesis. Why do we need a new explanation for the emergence of spina bifida with lipoma? Childs Nerv Syst 1997;13:336-40. Rahman NU, Salih MA, Jamjoom AH, Jamjoom ZA. 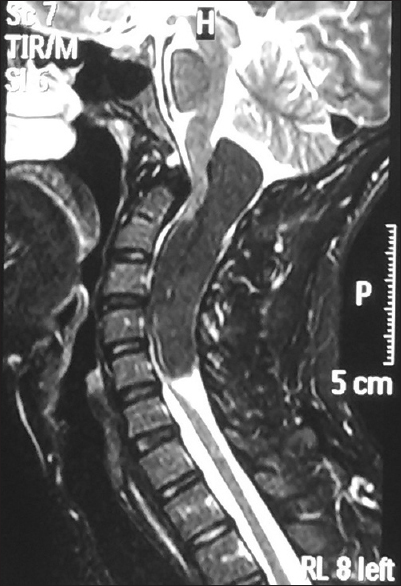 Congenital intramedullary lipoma of the dorsocervical spinal cord with intracranial extension: Case report. Neurosurgery 1994;34:1081-3. Arnold PM, Gust TD, Newell K. Intramedullary leiomyolipoma of the thoracic spine. Case report. J Neurosurg Spine 2007;6:438-40. Mohindra S, Gupta SK. Cervicobulbar intramedullary lipoma. Spine J 2009;9:e12-6. Chagla AS, Balasubramaniam S, Goel AH. A massive cervicomedullary intramedullary spinal cord lipoma. J Clin Neurosci 2008;15:817-20. Epstein FJ, Farmer JP, Schneider SJ. Intraoperative ultrasonography: An important surgical adjunct for intramedullary tumors. J Neurosurg 1991;74:729-33.